Midwest Motors Car Dealership in Eureka MO has CM Truck Beds IN STOCK! Looking for a truck bed in Eureka MO, or simply near St. Louis MO and need a truck bed for your work truck? Midwest Motors is St. Louis Missouri's home for aftermarket truck bed sales and installation. Not only can we order the truck bed you need, we have lots of models IN STOCK and ready to be installed – no more waiting for weeks when you need it now! Designed with the best and strongest materials – CM Truck Beds have Integrated Tube Headache Racks to keep you safe when the unexpected happens. With 3 ½" x 3 ½" tube headache racks, you can be sure you have the best protection in the industry..
Why risk rust with regular paint jobs the other guys offer? CM Truck Beds are coated in powder, so our powdercoat finish gets into every crack and crevice for maximum protection that will last you longer than our competitors. With structural 4" channel frame rails, you get a stronger, more durable frame rail that is much less likely to rust from the inside like the competition. In order to keep our product strong and prepared for abuse, we don’t use roll formed runners. More tie down points for straps and harnesses than the other guys – so you can secure your haul and drive wth confidence. Other bodies on the market which use 11 gauge and 13 gauge floors. CM Truck Beds use a 1/8” Steel Tread Plate Deck that can handle the use and abuse you put your truck through every day on the job. Our beds uses an independently tested durable gooseneck hitch, and holds a 7 way electrical plug to give you plenty of options for power. CM Truck Beds are equipped with a Modular Sealed Wiring Harness that is designed to reduce corrosion, wear and tear, and the elements. Best in class towing capacity with an independently tested pull hitch - integrated into the entire frame. Hook on to any trailer with this standard feature – you don't have to fidget with anything, just plug and play! Keep yourself, passengers, other motorists, and your cargo safe with our newly redesigned and very bright LED lighting. They also have the advantage of using less power than regular incandescent lighting – and last years longer! CM Truck Beds and Midwest Motors are proud to offer one the most durable subframes in the industry. Our 4” Structural Steel Channel Frame Rails are incredibly durable and have extra protection to keep the inside rust free. 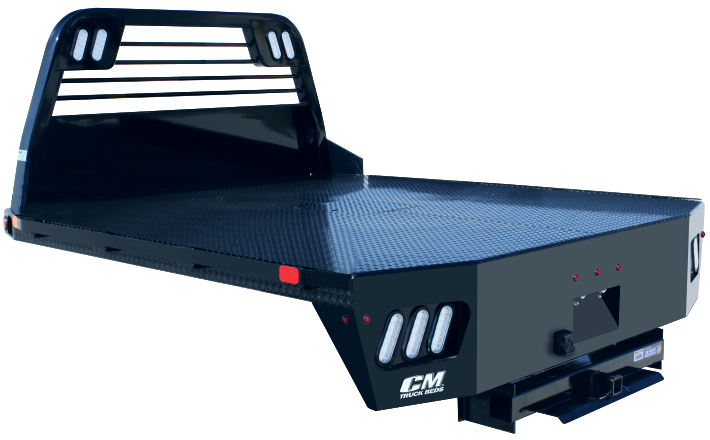 CM Truck Bed's angled fuel fill system makes sure you dont get gasoline splashback – just another feature that makes CM Truck Beds the most versative and convenience focused beds in the industry.